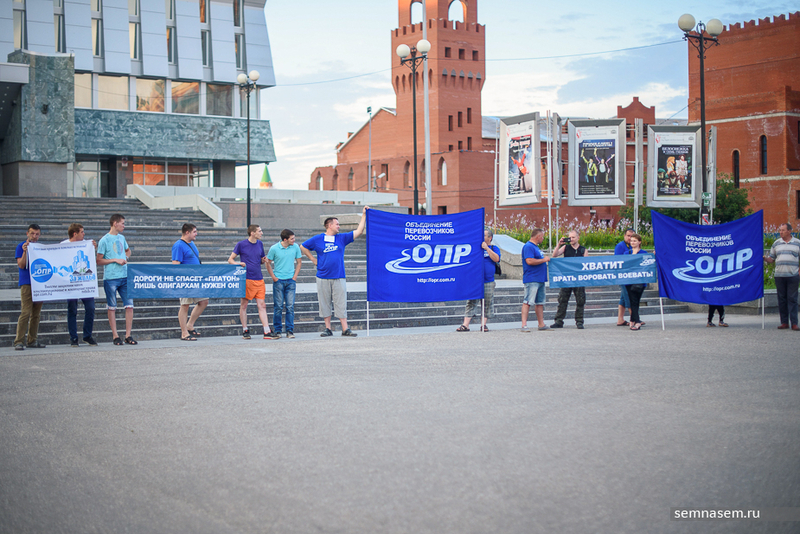 The Association of Russian Carriers (OPR) picketed Nikonov Square in Yoshkar-Ola on July 31. The picket was part of a cross-country road rally, led by OPR chair and trucker Andrei Bazhutin. On June 14, he announced his candidacy for the Russian presidency. A 7X7 correspondent attended the picket. Several members of the Popular Movement for Housing (NDZA) joined the road rally. 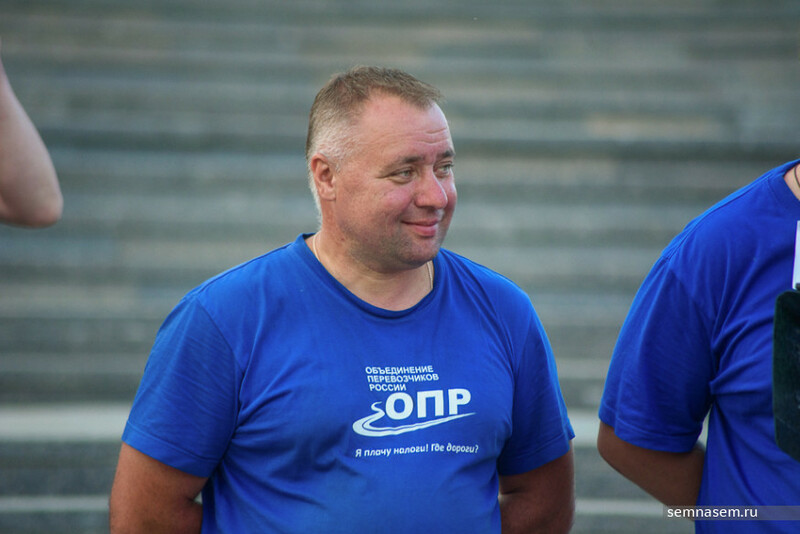 Andrei Svistunov, civic activist and founder of an independent trade union, came out to support the truckers with colleagues and friends from the local Alexei Navalny campaign headquarters. The road rally has taken place in an abbreviated form. Previously, big rigs were involved in it, but now the convoy consists of only two cars and a minibus. Residents of Murmansk, Vologda, Tver, Moscow, and St. Petersburg have been involved in the rally. It has been paid for by participants themselves and private donors. During their meetings with the people in the towns where they stop, the truckers talk about different problems, including housing and hoodwinked investors in cooperative residential buildings. “Initially, the Communists actively supported us. I met with Vladimir Rodin and Valery Rashkin, CPRF MPs in the State Duma. But they probably will not keep supporting us in the future, since we talk about the fact that Russia’s current party-based political system is rotten to the core. We are categorically opposed to the structure that has now been established in Russia. We believe the future lies with social movements, who must nominate grassroots candidates. That is probably the most positive know-how from the late-period Soviet Union that we can borrow. Power must rotate,” argues Bazhutin. 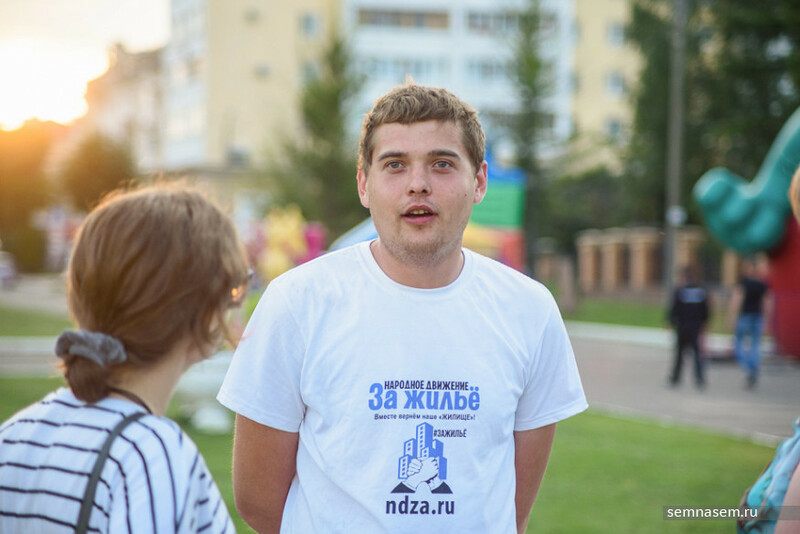 “2015 was the year of our camp in Khimki: our entire movement was launched there. Navalny filed a petition in the Commercial Court to reveal the terms of the public-private partnership agreement [establishing the Plato road tolls system], and many of our guys attended the hearing. Navalny wanted to visit our camp. But our goal was to keep the camp up and running, and if Navalny had shown up, we didn’t know whether it would have a positive or negative impact. So we turned him down. It led to a slight misunderstanding. Nowadays, we don’t say that Navalny has been going about things the wrong way. We see circumstances slightly differently. This concerns, for example, a united candidate from the opposition. He might not make it to the election. Those comrades over there [Bazhutin points to the law enforcement officers keeping an eye on the picket] might not allow it. If there is no such candidate, then what is left? We need candidates representing movements and grassroots organizations. Let ordinary folk nominate their own candidates. We shall see. Let them get themselves registered, and then we’ll decide whom to support,” said Bazhutin. The truckers of the OPR have been on an indefinite strike since March 27. They have made six demands, including sacking the current government and expressing no confidence in the Russian president, to abolishing the Plato road tolls system and recalculating the excise tax on fuel. The next stop on OPR’s road rally is Nizhny Novgorod.